Dishes Still Dirty? Blame Phosphate-Free Detergent A simple chore turned into a frustrating mystery for many people across the country as their dishes, glasses and pans came out of dishwashers spotted, filmy or still dirty. Detergent makers reworked formulas to comply with laws in 17 states banning phosphates, which cut kitchen grime but also pollute waterways. Sue Wright from Austin, Texas, says for months her cups and glasses have been coming out of her year-old dishwasher covered with black specks. She called three repairmen to her kitchen, but her dishes were still dirty. "I looked at a plumber's rear end for about two months this summer sticking out from under my sink," Wright says. "I was just totally frustrated. I couldn't figure out what was going wrong." Finally, after months of aggravation and expense, Wright found out the real reason for her speckled cups: This summer, detergent makers took phosphates out of their detergents. But dirty and damaged dishes are turning many people into skeptics, including Wright. "I'm angry at the people who decided that phosphate was growing algae. I'm not sure that I believe that," Wright adds. Sandra Young was so mad that she called Procter & Gamble, which makes Cascade, to complain. But when she did, a company representative told her to be more careful about which pans she puts into her dishwasher. "He said, 'Well, if you're really having that hard of a problem, maybe you should wash your dishes by hand.' 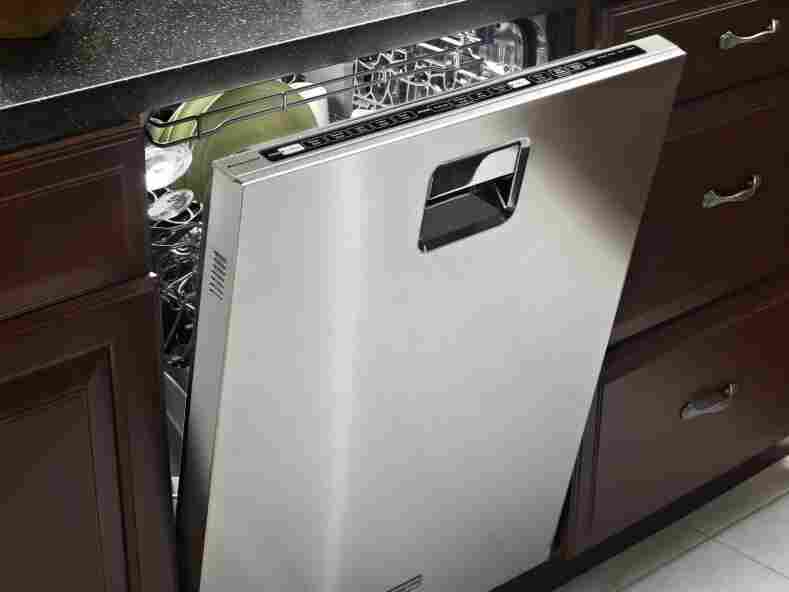 Which I thought was kind of strange for an automatic dishwashing company." "You know, this isn't really a huge environmental win," she says. Dennis Griesing of the American Cleaning Institute, a trade group, says it could take time, but phosphate-free detergents will improve. That's what happened with laundry detergents after phosphates were removed from them years ago. He says these inconveniences are part of a bigger trend. "We're going though a very significant readjustment in our lives to accommodate our ecological needs," Griesing says. But not everyone is willing to adjust. Sandra Young figured out a way to undo the phosphate ban -- at least in her own kitchen. She bought some trisodium phosphate at a hardware store and started mixing her own formula. "It seems to be working pretty good," Young says. Other people have given up on their machines altogether and are washing dishes by hand. But some are switching to other brands and making peace with phosphate-free detergents.